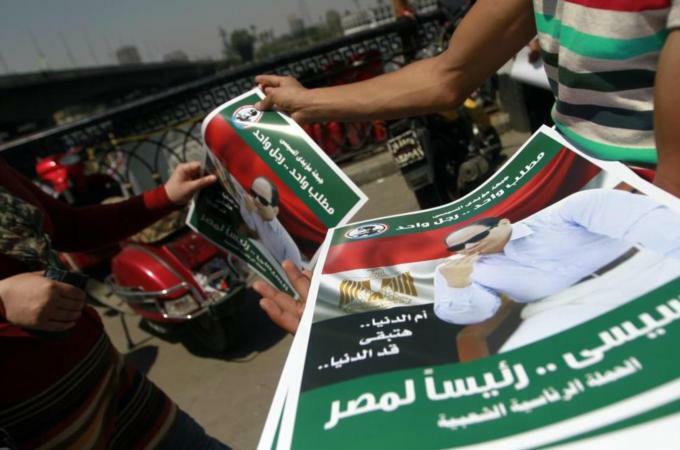 Egypt’s elections: More of the same? 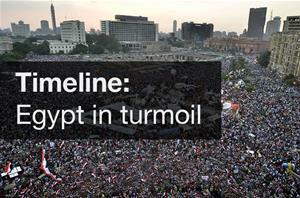 It is doubtful that the outcome of the elections will have any significant effect on Egypt’s security or its economy. Egypt’s upcoming presidential elections will pit military strongman Abdel Fattah el-Sisi against self-styled Nasserist contender Hamdeen Sabbahi. Only these two candidates remain after the Muslim Brotherhood was effectively eliminated from Egyptian politics and several other presidential hopefuls declared the current electoral process a sham. For the uninitiated, let’s take a closer look at both Sisi and Sabbahi, and consider the likely consequences of an electoral victory by either candidate. Sisi, a career military man, led Egypt’s July 2013 coup against then President Mohamed Morsi and the Brotherhood, and has since spearheaded efforts to eliminate the Brotherhood from political life. Last July, shortly after the coup, Sisi called on “honourable Egyptians” to help the military fight “possible terrorism”, a veiled reference to the Brotherhood and other pro-Morsi demonstrators. Since then, Egypt’s regime has been engaged in a war against terrorism that, while targeting extremist groups in the Sinai Peninsula and elsewhere in Egypt, has focused heavily on the Brotherhood, which has repeatedly denounced terrorism and has not been linked by evidence to any of Egypt’s recent bombings. The Brotherhood has also been officially banned and declared a terrorist organisation. Although Sisi indicated after the coup that he would not seek Egypt’s presidency, he announced in March that he would run for the nation’s highest office. According to a leaked interview, Sisi has had ongoing dreams that he would one day become Egypt’s president. He has also suggested, however, that he does not desire power for himself and that his candidacy is in Egypt’s national interests. Sisi has yet to release any specifics regarding his presidential agenda, but all indications are that he believes that Egypt should exist as a quasi-military state. In a leaked interview, Sisi said he believes it would be inappropriate for elected civilian officials to have political and economic sway over the military and that the military should be granted special “protection” in Egypt’s constitution. He has helped oversee the post-coup expansion of the economic dominance of the Egyptian military, which exerts control over a wide-array of industries, including furniture, bottled water, real estate, and energy, among many others. Sisi has also defended virginity tests performed by military doctors on young female protesters, and, in a lecture to military officers, appeared to assure the officers that they could not be tried for killing or injuring protesters. Also, in a leaked video lecture to military officials, Sisi lamented the post-revolution deterioration of Egypt’s state institutions and a media environment that allowed media to cross “red lines” in their coverage of the military. Sabbahi is a former journalist and career politician with a stated socialist, Nasserist orientation. He actively opposed the Mubarak government and supported Egypt’s 2011 uprising against the dictator. Sabbahi ran for president in 2012, finishing in third place. Shortly after Morsi’s electoral victory Sabbahi rejected Morsi’s invitation to become vice president, and, later called for a new round of presidential elections. In September 2012 Sabbahi founded the Egyptian Popular Current, a socialist-oriented coalition intended to challenge ruling Islamists, and, in November 2012, helped create the National Salvation Front (NSF), a loose coalition of anti-Brotherhood political forces. The NSF protested Morsi’s controversial power grab,rejected his invitations for a national dialogue, and supported the movement to remove Morsi from office one year into his four-year term. In spite of Egypt’s heavily one-sided media and political environments, Sabbahi has been allowed over the past week to both hold a press conference and deliver a televised address. He used both opportunities to discuss his presidential agenda. Sabbahi, however, has also attempted to separate himself from Sisi and present himself as a more democratic, revolutionary figure. For example, Sabbahi has suggested that the military should not be involved in politics, promised to revoke a controversial protest law, and said he will seek to release political prisoners not responsible for violence. He also said his presidency would focus on “transitional justice” – an unpopular idea among many Sisi supporters because it implies that there were crimes committed by the military and police in the aftermath of the January 2011 uprising. Sabbahi also indicated he would attempt to boost Egypt’s agricultural output, increase income for farmers and improve Egypt’s healthcare system. Moreover, in a departure from his earlier position, Sabbahi recently criticised the security forces for their use of force in dispersing last summer’s sit-ins. In the aftermath of a military coup, unprecedented state repression and an ongoing campaign designed to eradicate the Brotherhood – a group that won Egypt’s free and fair elections in 2011 and 2012 – Egypt’s upcoming presidential election has rightly been described as farcical. Sisi has been the nation’s de facto leader since last July, directing both domestic and foreign policy and regularly representing Egypt in meetings with foreign leaders and international organisations. Moreover, the media and political environments are propagandist and decidedly one-sided, both suggesting that Sisi is Egypt’s new saviour. Sabbahi has himself recently acknowledged that the environment is unfairand suggested that his expectations are low. Voter turnout will likely be low because the Brotherhood and other groups affiliated with the anti-coup alliance consider the current political order to be illegitimate and will boycott the elections. Government rhetoric to the contrary, the Brotherhood remains popular and their boycott will have a significant negative effect on turnout. Sisi is widely expected to walk away with a landslide victory, but regardless of who wins, Egypt is likely to continue to suffer from instability. As Mohammad Fadel has recently argued, it is difficult to envision any type of legitimate democratic turn in Egypt while the government’s exclusion of political Islam continues. Islamists are popular: A post-coup poll by Zogby Research Associates put Morsi’s approval rating at 44 percent, about the same as Sisi – and they are unlikely to accept their status as political outcasts. Anti-military coup protests have continued unabated for the past 10 months and have been a major disruption, particularly on college campuses. Faced with no prospects for political inclusion and angry that thousands have been killed or jailed, anti-coup protesters are unlikely to stop protesting simply because a presidential election comes to pass. Moreover, extremist Islamist groups like Ansar Bait al-Maqdis and Ajnad Misr have vowed to continue their campaign of violence against police, further muddying the political picture. Also, in recent months, liberal groups like the April 6 Movement have been repressed. Without a dramatic shift in policy, these groups are unlikely to become willing political participants in a new political order. Egypt, a nation fundamentally dependent on tourism, is unlikely to experience economic growth as long as instability persists; and stability is unlikely to emerge from the ongoing campaign designed to eliminate millions of Egyptians from political and social life. This means that Egypt’s most pressing problems – the economy foremost among them – will continue in the short term, regardless of who wins this month’s election.